SO RETAIL TRADERS LIKE YOU CAN GET IN, GET OUT, AND PROFIT WITH THEM ON A SET SCHEDULE, Using 5 Minutes A Week. Did you know that all the big institutions on Wall Street follow a profit schedule for all their stock buys and sells every year, at the same time each year (down to the EXACT trading day) – and this information is freely available for you to download? There are hundreds of stocks they do this with. I will show you. The big institutions make the same trades over and over again, year after year, ON THE SAME TRADING DAY each year. Most of the time, this drives the markets up or down and they profit big as a result. We, the small retail traders, not wise to this, end up on the other side of the trade, handing over our hard-earned money and retirement funds, all the while hoping the market will turn in our favor. We end up losing because we get in after the big guys, and we get out when they have all taken their big profits and their fat bonus checks. What if I told you EXACTLY when all of these big scheduled trades are going to happen and which direction these stocks will go? And how you can maximize your profits by 50-100% using options to trade it – all by spending 5 minutes each week. ­Since you are on my customer hotlist, I am inviting you to join an exclusive club to access these “Profit Schedules” Wall Street follows so you don’t have to be on the other side of their trades. You are probably wondering how I know about these schedules and if this is a too-good-to-be-true scam. This is not a scam at all, it is actually what I uncovered from the results of LOTS and LOTS of historical data analysis looking for seasonal price patterns of hundreds and thousands of stocks. All the historical data can be freely downloaded from finance websites such as Yahoo Finance. Between November 13 and December 26, Rockwell Automation (Symbol: ROK) has traded up 21 of the past 23 years (1995 to 2017). Yes, you read that right. The same date of entry and of exit (unless it is a holiday, then it is the next trading day). Every year. The only 2 down years were 1998 and 2006. It all adds up to a 91% win rate with an average profit of 6.76% – Now that’s a true Boxing Day gift! Using options would easily increase the ROI to 50% to 100%. Let’s look at ROK’s price history to see this “profit schedule” at a glance. If November 13 is a holiday, the entry is shifted to the next trading day, and if December 26 is a holiday, the exit is shifted to the next trading day as well to keep the “schedule” consistent. You can count on this pattern EVERY YEAR. With such a high winning %, would you trade the “schedule” if you had it? Here’s the story of how I uncovered hundreds of these “Profit Schedules”. My name is Matt Choi, and I am a trader educator with over 17 years of experience trading the markets AS A SUCCESSFUL RETAIL TRADER. I am considered an outsider. An underdog (because they say only 10% of traders make it). I never worked on Wall Street betting with other people’s money. I traded my own hard-earned salary, and for years I struggled in trading. It would seem that I had found the perfect stock, I did all the research, the support was right where it should be, and I waited for trend confirmation. I placed my order and thought I would just ride the way up. The next morning, I check my computer to see how far it had gone up, but it had tanked. I was sick to my stomach with disbelief. It just kept tanking. Lower and lower it went. Then I realized with a knot in my stomach, I had bought at the top. It was as if the guys on Wall Street was waiting for me to get in through the gate so they can screw me over personally. This kind of scenario kept happening to me. I hated being screwed. I wasn’t used to being so wrong so often. I struggled a lot and lost my entire trading account twice over; until I met the late George Fontanills (founder of Optionetics), who became my mentor. He taught me to follow my strengths and trade according to my personality. This was the single most valuable piece of trading advice I ever got. I am great with numbers and data. I enjoy developing systems and refining them (I used to manage the transportation logistics of a multi-national pharmaceutical company and being accurate is a daily job requirement). of being right (I’m talking about 80% or higher). I learned early on that people are biased, they can lie (because everyone has an agenda), but historical data always tell the truth. I began to develop my own, more refined options strategies and rule-based trading systems based on my price data analysis. I also started writing simple programs to automate some of my analysis and pattern searches. Because using Excel spreadsheets took WAY TOO LONG! This is how I discovered hundreds of stocks with VERY predictable trading schedules that happen EVERY YEAR, ON THE SAME TRADING DAY. The results are highly accurate, most with over 80% probability! Because I really like to be right, remember? Finally I was making a great living solely from trading. The freedom allows me to spend more time doing other things I love, like travelling with my family and playing soccer with my son. 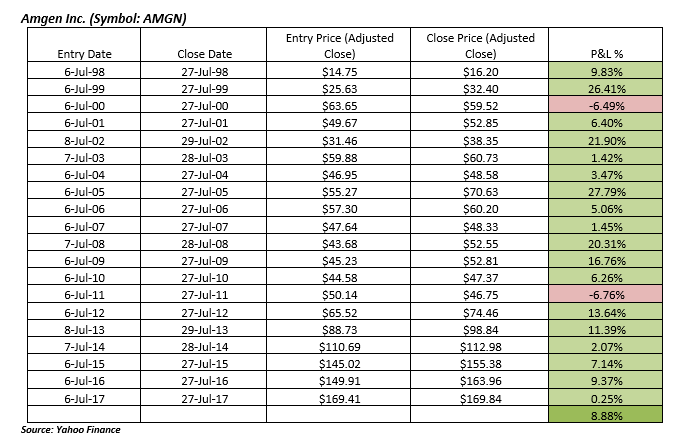 Amgen Inc. (Symbol: AMGN) is a stock that the pros from Wall Street have on their buying “schedule”. It has a strong seasonal tendency to move up in July. The stock moved up 18 of the past 20 years between July 6 and July 27. If July 6 is a holiday, the entry is shifted to the next trading day, and if July 27 is a holiday, the exit is shifted to the next trading day as well to keep the “schedule” consistent. From 1998 through 2017, only 2000, and 2011 were losers. Imagine how much more confident and consistent you would be with your trading with odds like this? The average profit is a solid 8.88% each year during this scheduled period, and using options you could easily increase the ROI to between 50% and 100%. If you knew this back in last July, would you have traded it? Now that you know this, aren’t you excited to put this into your trading schedule/plan for this coming July? What if you had the profit schedule for every month of the year? How will this help your trading? You can just execute with certainty that you are likely going to come out a winner. Because you hate being wrong as much as me. No more “bought at the top and sold at the bottom”. That would be 52 stock trades a year that you don’t have to look for, or feel unsure about. What if you can leverage options consistently to turn a 3% or 5%or 8% stock move into a 50%-100% ROI? How much sooner can you retire? Now that you know such profit schedules exists, wouldn’t you use it over and over again every year to grow your retirement funds? You must be wondering by now, does this seasonal “schedule” work for stocks going down as well? Do Wall Street traders dump or short stocks on a pre-determined “schedule”? Skechers USA Inc. (Symbol: SKX) has traded DOWN 17 of the past 19 years between September 14 and September 27 with an average drop of 6.82% during this period each year. in a pre-dominantly bullish market. Those who prefer not to short stocks can use a simple bearish options strategy to profit from this “schedule” with 50% to 100% ROI. 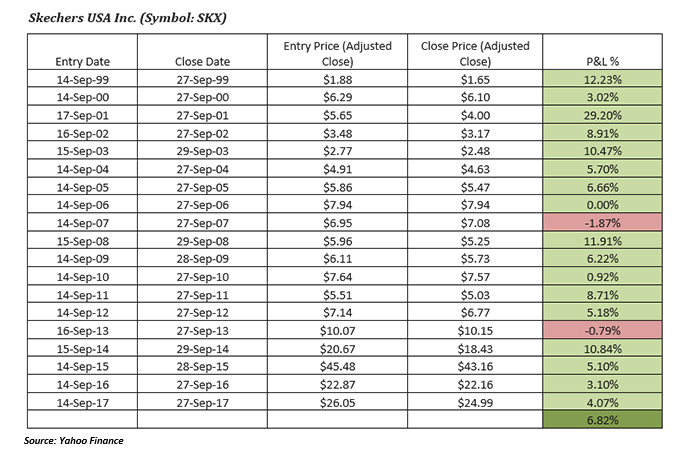 Let’s look at SKX’s prices since 1999 to see this “profit schedule” in action. Remember, if September 14 is a holiday, the entry is shifted to the next trading day, and if September 27 is a holiday, the exit is shifted to the next trading day as well to keep the “schedule” consistent. Even during a bullish environment, SKX exhibited a consistent bearish seasonal pattern simply because large institutions were selling the stock according to their “schedule”. or played the short side for profit. You can now be the trader in the know and not the amateur. I have just given you 3 high-probability stock moves all with win rates of 89% or higher you can use. I have found hundreds of these “scheduled buys and sells”. The guys on Wall Street are creatures of habit and I have uncovered their trading schedules after painstakingly analyzing over 20 years of stock data. The concept of seasonality is not new, it is not an original idea, ALL TRADERS KNOW IT HAPPENS! But they never had the exact dates. Now you can since I have PROVEN IT TO YOU with these stocks. Those of you with hours each day to spend data-crunching can easily find these Profit Schedules using the method I showed you. YET 99% of traders will not make use of this knowledge because it takes a lot of work. This is why the BIG GUYS KEEP WINNING AT YOUR EXPENSE. But I’m a contrarian. I like to root for the underdogs, the outsiders. Probably because I am an outsider. I like to help other outsiders win against the big guys. You know that baseball movie with Brad Pitt based on Michael Lewis’ bestselling book Moneyball? Well, it is about how Billy Beane (the GM) and Peter Brand (Assistant GM) of the Oakland As, a small market team with a small budget (read: the underdog) used player statistics to compete against large market teams with deep pockets. Beane and Brand, who was a Yale Economics grad and stats geek (outsider! ), poured over statistical data and found that traditional metrics (such as batting average) the scouts used to find players were not always the best indicators of success. The Oakland As, in their painstaking analysis of the numbers, found that on-based percentage and slugging percentage to be a better indicators of offensive success. What they discovered in their data analysis gave them their advantage, allowing them to buy players who were undervalued but has a statistically higher chance of success. With this strategy, they assembled a winning team on the cheap. Their 19 game consecutive win was proof that they were right. Historical statistical data are much better predictors of success than any guru or expert. Most people (many experts included) ignore objective data in favor of their subjective opinions, so if we can understand what past data tells us, we can use this to our advantage. Following a system based on what the data tells us gets us consistent wins. With the right data analysis, the underdogs can win. Consistently. What if I just gave you the Profit Schedules with the highest probabilities? Every week. And an options trade to leverage it that you can execute in less than 5 mins? Back to that exclusive club invitation and helping outsiders win against the big guys. share what I’ve found with you, fellow retail trader. 1) I do ALL the data analysis (heavy lifting) to give you the exact Profit Schedule for stock moves Wall Street will make every week. Because let’s face it, you just want the results of my labor. You are too busy to do all the data crunching I did over the past 4 years. You have a demanding job, or you have young kids, or you just can’t be bothered to use Excel spreadsheets. Whatever it may be, I have already done the work. It is easy for me to share what I have found. Looking for a way to “get rich quick” – this won’t do that. This is a rule-based strategy system designed to take advantage of the regular buying and selling schedules of Wall Street. This is to help you get in and out WITH the big guys and NOT BEHIND them. Someone who can’t follow simple rules or likes to trade “on a whim” – these profit schedules are set, Wall Street follows them consistently, so you should too. A day-trader who likes to get in and out on a stock multiple times a day. These stock moves are scheduled over days, not minutes. An exclusive paper-trader. If you have NEVER placed a real trade, this is not for you. Trading is about making money, if you have NEVER used real money in trading, you are not serious about this or you have no risk tolerance, you should stick to monopoly. A whiner. No one likes a whiner and I sure don’t want one on our Members’ Monthly Coaching Call or in my inbox! If you are none of the above, then membership to my Profit Scheduler Club will give you a better return for much less work than your gym or golf membership. If using options to gain 50-100% ROI on Wall Street’s scheduled stock moves EVERY WEEK with high probability AND without any data work on your part sounds like something you want to take advantage of, here’s more. Access to an exclusive member’s area where I will share my top 2 picks each week that is 80% or more accurate. That’s 104 high-probability stock moves A YEAR that Wall Street makes! Each Profit Scheduler stock I share will have a high-probability options set up. Because we all hate to be wrong, so I make sure the odds are in our favor! I include Bullish and Bearish options plays to keep the portfolio hedged so you can sleep better at night knowing your retirement account won’t disappear. Immediately executable options trades with high probability that you can put on in less than 5 minutes. I lay it all out simply for you. You will see exactly how I intend to trade the scheduled stock move using options. So you can turn a 3% stock move into a 50-100% gain. Did I mention this is a growth strategy? You will get the complete entry, exit, and strike prices so execution is simple. The entry and exit dates will mimic the precise Wall Street scheduled buy/sell to ensure we are getting in with the wolves and not the herd. Simple options strategies that can be used in retirement trading accounts so you can grow your funds faster. 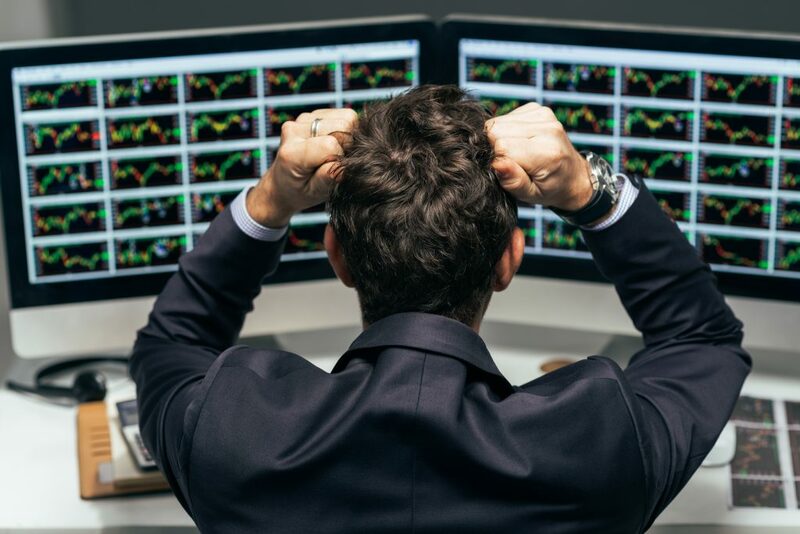 NO MORE ANALYSIS PARALYSIS – you will know with high degree of certainty how the stock move will go because it is historically proven to be on a Profit Schedule. I keep things clear and simple. Anyone who has attended any of my trainings or purchased any of my $1997 courses will tell you I have a way to simplify the most complicated concepts to make everything doable. That’s why it would only take you 5 mins to execute the trade. Options trades will include straight calls and puts, credit and debit spreads for easy entries and exits. This is a great way for beginners to trade options but also a great way for more advanced traders to add another rule-based strategy to their portfolios – we can always use more high-probability set ups! Monthly access to me live via group coaching calls that are exclusive for club members. On this call, you can ask your questions, we can discuss recent options trades, so that I can personally help you achieve success in your options trading. I will share the same trading insights and options tips that I share in my mentorship program that cost $20,000/year. My top Pinot Noir recommendations. This has nothing to do with trading but many of my students love wine as much as I do and find my Pinot picks bang on. I will share them with you on the calls if you ask. Because good wines, like good trades, should be shared. All this access to Wall Street’s Profit Schedules and my options set ups to trade them is expensive. You still have to show discipline, follow the rules, and execute the trades on the schedule to make money. If this is making you scared, then stop. Go and buy some other cheaper options course that only teaches you how to buy puts and calls. Spend your precious trading hours researching and analysing rather than putting on winning trades. You will find out which stock is scheduled for a buy between December 12 and January 19 of every year (this move is accurate 85% of the time in the past 26 years). As a club member, you would have seen my Bull Put Credit Spread on this stock that returned +98%. Did you know that Unilever U.V. (UN) is on a Profit Schedule? It is 81% accurate. What about Ford Motor (F)? Want to know when it is scheduled to be traded by the big guys? Want to know how I used a Straight Long Put to get +128% ROI? 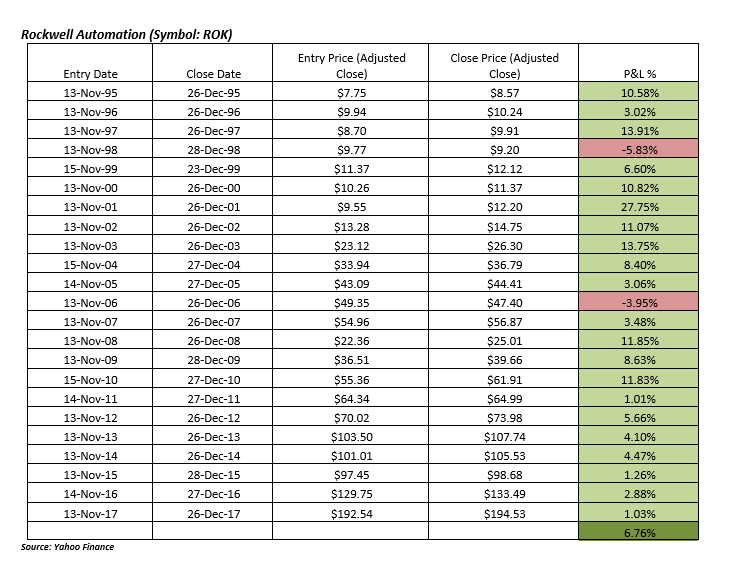 As a member of the Profit Scheduler Club for Options, you would know all of these scheduled stocks as well as the best options trade to 5x to 10x your profits. You will have immediately executable, high-probability trades EVEN IF YOU ONLY HAVE 5 minutes a week to spend on trading. Traders with busy full-time careers who want to manage their own portfolios but don’t have time for steep learning curves and costly mistakes. Beginner Options Traders who needs some help finding and structuring their trades. It is done for you. Every week. Intermediate and Advanced Options traders looking to add high-probability and simple rule-based strategies to their existing portfolios. The Profit Schedule can be used as an independent approach or combined with your existing trading strategy. Traders who are sick and tired of being on the other side of Wall Street’s stock trades. You know those times when you have bought a stock and then the stock tanks almost immediately after you get in…it’s like getting punched in the gut when you realized you had bought at the top. Busy Traders who want to trade with their retirement accounts and need a long term growth strategy with lower risk. This is perfect for Part-time traders who have limited time to find the right trades, because all the tedious data work is done for you. Now you may be thinking, well, I am good with numbers and like data. Why don’t I just try to find these profit schedules myself? You certainly can do it yourself, but why do you trade? Is it to have fun with analysis, or to make more money using less time? Let’s be honest, we’ve all suffered from ANALYSIS PARALYSIS. How many times have you missed a trade because you waited too long? Stuck in uncertainty? Having too many choices? Can’t pick THE right one? The Profit Scheduler Club for Options help you take away all that. You will get the best high-probability profit schedule stock (proven with data!) and the exact options trade to use to maximize profit. Every week. If you are still reading this, you are probably wondering, ok, how much? Well, it is not cheap. I spent a lot of time looking for Wall Street’s hidden “Profit Schedules”. My time is extremely valuable. You will be getting two scheduled stock moves (that Wall Street is scheduled to make) a week with a high-probability options trade (so you can turn your ROI into 50%-100%), that’s 104 high probability trading opportunities a year! You will know exactly what date to enter and exit a trade to fully capture the stock move. Every week there will be a different stock that is scheduled to move on a definite date. How much more profitable and consistent will your trading be with this knowledge? Annual Membership to my Profit Scheduler Club for Options costs $2997/year. Yup. It’s steep. This is for serious traders who trade with money. Think about how having 104 scheduled stock moves (all with over 80% accuracy) AND 104 high-probability options set-up will improve your ROI? How much time will you save not doing data-analysis or searching for high-probability trades? How good will you feel, knowing you will have clear entry and exit dates for each trade that is based on historical data, and not just someone’s best guess? How much is your time, peace of mind, and high-probability ROI worth to you? 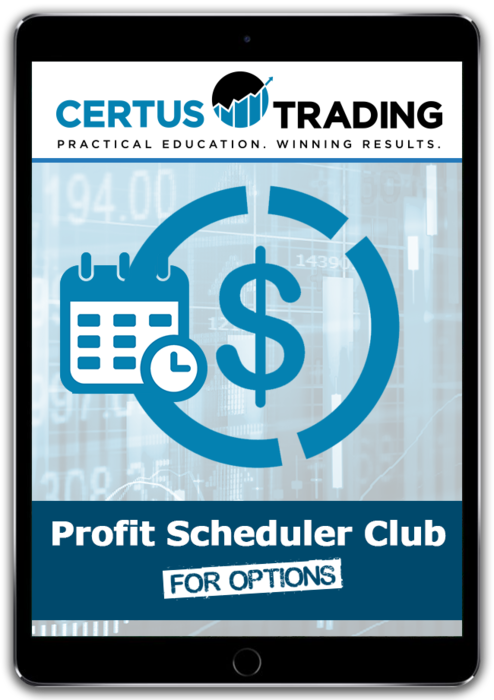 Annual Membership to my Profit Scheduler Club for Options also gives you direct access to me every month, so I can personally support you in your trading success. Be decisive. Join now to avoid missing this week’s scheduled move and high-probability trade. I hope to meet you on this month’s member call. P.S. If you really need more reassurance to join, here it is: you get a 30-day money back guarantee. So it’s really risk-free. Click the button to order now and you will get immediate access to the Profit Scheduler Club for Options and see this week’s upcoming stock move and options trade. My first trade more than paid for the course! "I have only been a subscriber to the Profit Scheduler Club for less than two weeks, but my first trade, a long Put on TXT, more than paid for the course. In fact it returned 100% ROI and in 3 days I profited $4800! Thank you Matt!" You are obviously an intelligent, honest, and dedicated mentor.. I am impressed! "I've found your options program very interesting, informative, and already financially beneficial. You are obviously an intelligent, honest, and dedicated mentor. I am impressed! My favorite is Fly2 (4 wins & 0 loss ) which has paid for your program.” "
The 3 cases I made profit from are all based on your Nostradamus-like predictions. "So far, my experience has been fantastic. The 3 cases (TXT, EL and UEPS) that I made profit from are all based on your Nostradamus-like predictions. Amazing! If this can go on consistently, it will change my life. Thank you so much!" "I am very happy I think Matt has thought this program out very carefully and how to teach others because he has been in our circumstances as a retail trader before becoming a professional trader and he knows what it takes to get there he has simplified the trading plans as much as he can so people can understand what he is trying to teach them and taking as much risk away for them as he can, he is sending out trade alerts when he sees these setups that belong to the 8 option strategies so we get an over view of different situations and market conditions as these conditions change all the time." I have paid back the cost of the course and a little more in 2 weeks on two trades. "AMZN condor which I took thru expiration and the Netflix Condor that I got a little scared out of on the Call side a week early so I liquidated that half of the spread and just held the Put side thru expiration and kept about 30% of the overall credit." Last week was my first time trading this system and I am up over $600.00 already. The profit scheduler is a fantastic system and i love it soooooo much. Two months in and have already paid for the course. I am using your signals for my trading and my personal account shot up close to 30% within 3 short months. "Matt, it was pleasure speaking with you on the phone. I never thought you are easily approachable person just based on email request. The 30 minutes just went by so fast. I am the happiest customer since I joined you. I am using your signals for my trading and my personal account shot up close to 30% within 3 short months. As I said yours is the best proven method, no doubt about that. I am happy that I came in contact with you. I like the FOP and Iron Condor the best and most profitable trades until now. As I stated, my wish is that I would independently trade these trades but still not there yet. I need help on how to spot trades and do independently. I need help on that. For now, just trading your signals and making money and I am very happy and satisfied with your signals.God Bless you and your family. Thank you"
"One of the key things that has justified the program for me is your explanation of market psychology, especially around earnings. I have watched the charts for years, trying to understand what the trends mean, but your explanation of volatility, and the " volatility crush" brought about an " aha " moment for me. On several trades since I started your course, I have covered the cost of the investment, and look forward to be much more focused in my tactics. 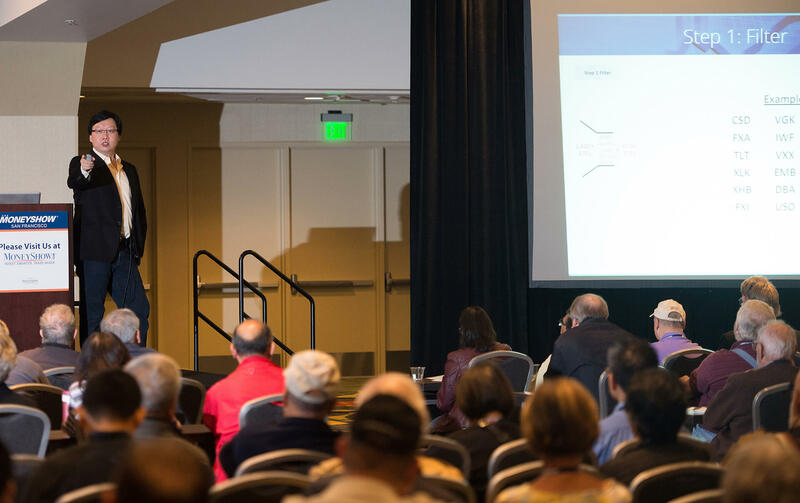 From the insights on trading during earnings gained from your course, using your insights and my own strategies, my gains have been at least 10x times that." "I am soooo happy that I can now have a trading plan that can work in all markets. Matt is a guy that is fun and direct about what you need and don't need to do. I have traded most of his blueprints and feel very safe about the results. The best part is they work. With your system I am batting 72% doing long duration trades and what has helped is knowing when to back ratio to make any needed adjustments. I feel like I am in control and not just taking a chance. It's nice to be able to grow on income made from trading. I am 651/2 and in 41/2 years will retire and love being able to still have great income. Forever great full to you Matt." The key point for me was the financial and personal freedom that I could have to do whatever I wanted whenever I wanted. "That meant to me not having to say, "we can't afford that" to my family, and having something good to pass on to them. I am retired and disabled from a stroke now, and I still want to set a good example. Matt, you proved that it can be done. I think I am learning to keep emotions out of my trading decision making, and to use stops to protect me from myself and unforeseen market conditions. Thank you Matt for putting together a fine course." Matt is straight and to the point. He tells it as it is and doesn't put any frosting on it but helps you with the details. "I decided to take the course because of Matt. I found him straight-forward, honest, and down to earth. Also I was looking for a course I could return to so I can study the strategies. Listening to Matt enthusiasm and clean candid comments. Having access to Options Alert for 6 months helps learn and earn at the same time. Your course also found areas I need to improve so I can be successful at trading options. I learned if I do not become more structured, organized and disciplined then it will be hard to succeed. I have seen Positive results with most of Matts trades. Some has been over double profits and some have been only a few hundred. One or two have been losers but I expect that but was still able to pull out only losing very little. Matt is straight and to the point. He tells it as it is and doesn't put any frosting on it but helps you with the details. I like the one-on- one availability of Matt for specific questions. No other trading service allows the one on one." Certus Trading Inc. provides education and training services only. The services and materials provided should not be interpreted as investment advice, an endorsement of any stocks, ETFs, futures, options, and currencies, or an offer to buy, sell, hold or trade stocks, ETFs, futures, options, and currencies. Certus Trading Inc. assumes no responsibility or liability for your trading or investment results. You assume the entire cost and risk of investing and are solely responsible for any and all gains and losses, financial, emotional, or otherwise, experienced, suffered, or incurred by you. PRIOR TO MAKING ANY TRADING OR INVESTMENT DECISION, IT IS STRONGLY RECOMMENDED THAT YOU SEEK OUTSIDE ADVICE FROM A QUALIFIED INVESTMENT ADVISOR. CERTUS TRADING INC. DOES NOT PROVIDE OR GUARANTEE ANY FINANCIAL, LEGAL, TAX, OR ACCOUNTING ADVICE OR ADVICE REGARDING THE SUITABILITY, PROFITABILITY, OR POTENTIAL VALUE OF ANY PARTICULAR INVESTMENT, SECURITY, OR INFORMATION SOURCE. Please visit our website at https://certustrading.com/disclaimer/ to view the full disclaimer.